Classic Car Insurance in Spain to protect your classic Cars and Motorcycles on English and Spanish number plates. Whether we are a car enthusiast or we just like looking at some of these beautiful old and well restored vehicles, they all need to have insurance to be used on the Spanish roads. Classic cars are a passion and at www.insuranceinspain.com we specialise in providing the necessary insurance for classic and vintage cars in Spain. 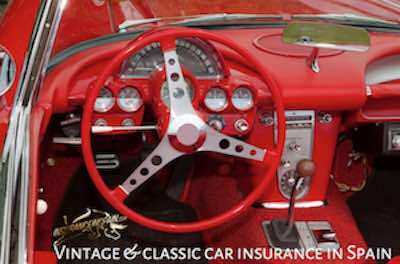 It is important to make sure that your loved classic car is suitable insured on an agreed value classic car insurance policy. why is this important? As vehicles get older, insurance companies in Spain tend to devalue the residual value of the vehicle and in many cases, once the vehicle has reached over 10 years old, they will only offer the Spanish book value for that vehicle - even if it is insured as fully comprehensive. This residual value, or write off value as it is more commonly known can be as low as 1,000 Euros. In most cases, it would not be possible to find another car in a similar condition for that residual value in Spain, as the second-hand value of cars in Spain is considered to be high. This is because of the good weather conditions and the fact that cars do not rust in a way they may do in Europe. By having an agreed value insurance policy, it ensures that if your car has a residual value of an agreed say 5,000 Euros, then that is what you would receive in the event of a total loss event. As standard on all classic car and vintage car policies. In the event that you were to breakdown and can`t fix it on the side of the road, a recovery vehicle will collect your pride and joy and take it to a nearby garage or suitable repair centre. If you are a long way from home it also covers your stay in a hotel whilst it is repaired. * Subject to the terms and conditions of the contracted policy. There are a variety of classic and vintage car policies available to you. Third party with breakdown recovery, legal defence and glass cover. Third party with fire and theft, legal defence and glass cover. Fully comprehensive policies which also include all of the above. Clasic motorcycles and bikes can also be insured. Classic and vintage bikes and motorcycles can only be covered on a third party liability basis with breakdown recovery and legal and defence cover. We insure all types of classic and vintage vehicles, whether they be cars, bikes, bikes with side cars, trikes, vans, American muscle cars, pickups, classic vans and motor homes, military vehicles and just about anything that is classified as a classic or vintage vehicle. You must be a member of a Spanish Classic Car Club. You will need to provide a vehicle valuation from a recognised Spanish car club or classic car organisation if you want an agreed guaranteed value on your insurance policy. The policy may be restricted to a specified annual mileage. The vehicle must be parked securely when not in use. Classic vehicle policies are for named drivers only.